Rep. Carlos Curbelo, R-Fla., occupies a strange place in politics these days. In an era of increasing polarization he’s a moderate Republican who represents a swing district. That alone makes him an outlier. Carlos Curbelo speaking at the 2014 Conservative Political Action Conference (CPAC) in National Harbor, Maryland. But he’s also staking his political reputation on solving an issue nearly verboten in the Republican-controlled Congress: climate change. He’s called President Trump’s decision to yank the U.S. from the Paris Agreement a mistake, introduced legislation to combat climate impacts and helped create a bipartisan caucus all aimed at dialing back the partisanship around one of the most pressing problems not just in the U.S., but in the world. Whether he succeeds — or survives the 2018 midterms for that matter — is very much up in the air, but his work represents one of the few efforts toward climate action by Republicans on the national stage. Curbelo represents the southern tip of Florida. His district includes the Everglades, Florida Keys and parts of the Miami metro area, some of the most vulnerable places on earth to sea level rise. In Key West, climate change is responsible for 94 percent of all flood days over the past decade, a number that will increase as land ice melts and pushes oceans higher. Roughly 10 percent of his constituents live within five feet of current sea levels. Just to the north of his district, Miami Beach has spent $400 million on pumps to reduce the number of sunny day floods. Understanding and addressing these risks is central to Curbelo’s legislative efforts, including a recent bipartisan bill he introduced in the House calling for $3 billion annually to improve wetlands and flood infrastructure. Those efforts also run against the grain for many Republicans at the federal level, who have largely ignored climate change or denied the science behind it. President Trump and a number of his cabinet members have falsely questioned the influence of human carbon pollution on the climate and have enacted policies out of step with taking action to reduce that pollution. Nearly 60 percent of Curbelo’s Republican colleagues in the House are climate science deniers, according to a ThinkProgress analysis. That makes it exceedingly unlikely that a bill like Curbelo’s will end up for a vote on the floor. 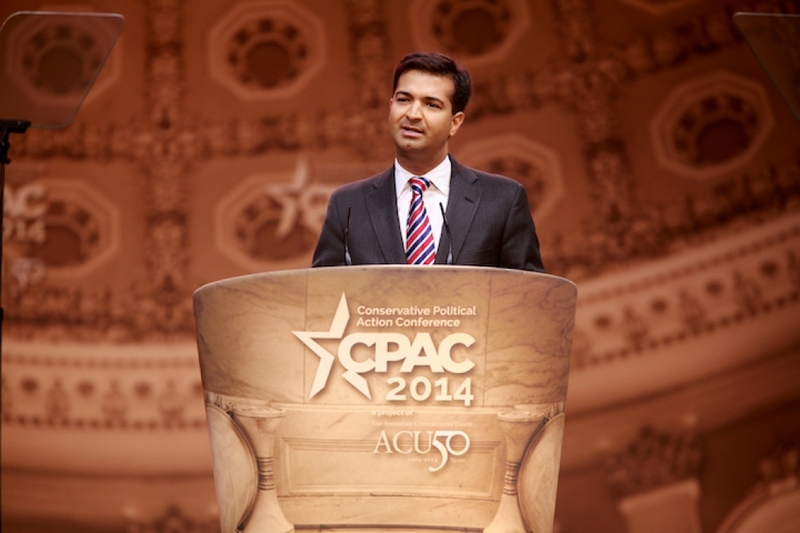 That hasn’t stopped Curbelo from laying the groundwork for Republicans to act on climate. Along with Rep. Ted Deutch (D-Fla.), he began a bipartisan climate solutions caucus in February 2016 to find common ground on climate change. There was a surge in membership after Trump’s election and the group now includes 40 representatives split evenly among Democrats and Republicans. That’s because the caucus has what Curbelo dubbed a “Noah’s Ark rule,” requiring each new member to join with a partner from the other party. Republican caucus members hail largely from districts painted light shades of red or even purple on the electoral map. Curbelo himself represents a district that Hillary Clinton won in the 2016 presidential election by more than 16 points. But there are also a handful of representatives from deep red districts, including Rep. Mia Love from southern Utah and Rep. Don Bacon from Nebraska. It’s a grand vision for a group founded a little more than a year ago. But with Republican control of all branches of government, it’s going to be hard for the caucus to deliver legislative achievements anytime before the 2018 midterms. Beyond sharing information, many caucus members have been loathe to stand up the administration’s climate policy rollbacks. While Curbelo has been forceful in his condemnation of Trump’s decision to withdraw from the world’s main climate pact, other Republican caucus members largely stayed silent. The first public caucus meeting was sparsely attended, according to Emily Atkin at The New Republic, though representatives there said that’s the norm for most caucus meetings. That raises concerns the caucus could be used to give cover to Republicans in vulnerable districts while not doing anything to change the status quo. Rep. Darrell Issa (R-Calif.), for example, joined the caucus in March despite having a lifetime score of 4 percent on the League of Conservation Voter’s environmental scorecard and consistently voting against clean energy and climate action bills in the House. His district is considered a tossup, though, and joining the caucus could provide him with political cover. For Curbelo, the caucus is clearly about more than sending signals, but there’s a chance he might not be around to see the caucus develop past its nascent stages. Nationally, he represents the most Democratic district held by a Republican, according to the Cook Political Report, a position that puts him at risk in what could be a sea-change of a midterm election cycle in 2018. None of this is to say his efforts to build the caucus are a dead-end endeavor. Climate change has been a partisan issue for more than a decade, and representatives who have served during that period have harden those views through years of voting records, lobbying efforts and peer pressure. But Curbelo — himself just 37 years old — said younger, new representatives, particularly those who are facing clear and present climate change impacts in their districts, could start to turn the tide. A growing number of Americans are also concerned about climate change and favor addressing it. There’s also the reality that eventually the U.S. will have to get serious about cutting its carbon pollution in order to stave off the worst impacts of climate change. Even if Curbelo were to lose his seat in the 2018 midterms, his work establishing the caucus could still matter in the years to come.